Woody started training teams for Jaier in 2007. He currently trains the U12 Boys A team. In the past he has trained the U12, U13, and U15 boys' age groups. Woody always finds a way to get the best out of his players. 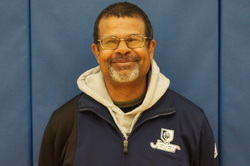 He started coaching club soccer teams in 1982. He coached his son Jason at U9 and U10 for the Maple Shade Cosmos Soccer Club in New Jersey. He has also coached his son Jeremy and daughter Tori through their youth soccer days. Woody was also one of the founding members of Southwest Michigan Select Soccer Club along with other parents who felt there was a need for club soccer in this area. Currently, Woody is the Head Coach for the Bridgman Men's and Women's Varsity High School Soccer Programs. During this time he has aided in the development of 27 All-State players and numerous All-Conference players. He has won a combined 8 District Championships, 3 Regional Championships, and made three appearances in the state semi-final game. He has also been named District Coach of the Year 6 times and in 2008 he was named the MHSAA State Coach of the Year for Division 4.